If you struggle with anxiety or depression, have you taken a good look at your diet lately? Do you feel yourself crashing at certain times of the afternoon? Maybe you reach for something sugary to get you through those last few hours before dinner only to feel even bluer about an hour later. There is a connection with the way we feel and what we put into our bodies. How can there not be. 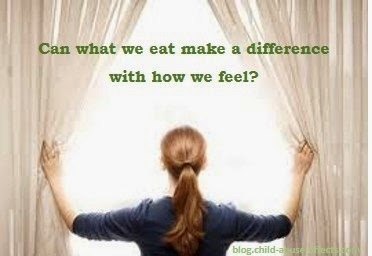 When we feed ourselves nourishing foods, our bodies can respond optimally. When we don't, our bodies, including our brains, struggle. So it stands to reason that if there are foods that can wreak havoc on the physical body and mental state, there must also be foods that do the opposite. Foods that boost the immune system. Foods that increase or support the feel-good chemicals in our brains. Foods that halt, even reverse, our body's chronic inflammatory response when something is amiss. Since the 1960's, we've all been sold a bill of goods that depression is caused by so-called chemical imbalances. There is no proof that such imbalances actually exist. Many have rushed to their family physician in search of an easy-to-pop pill to cure them of their depression and anxiety. Of course, that's what the pharmaceuticals wanted all along. They have kept the myth alive in order to sell more psychiatric drugs. And sell they have. Now don't get me wrong. I'm not advocating that you go off your meds. And I'm not saying don't go on them in the first place. Nor am I passing judgment. I'm offering an alternative. Something else to look at. Can we instead change our diet in a way that alters mood without popping a pill that can leave us with unwanted side effects? Are there foods that actually cure or at least alleviate depression and anxiety? Let's take a look at some foods that are proven to benefit our bodies. And then, make an informed and very personal decision about how to proceed, with or without meds. The following are rich in proteins, Omega fatty acids, and/or vitamins that have an impact on elevating mood, stabilizing blood glucose levels, and reducing the inflammation cascade. All of which can have a positive effect on people with clinical depression. Foods that stabilize blood sugar levels will bring about more energy and elevate mood. Try gluten-free grains such as quinoa (pronounced keen-wah), lentils, amaranth, buckwheat (kasha). 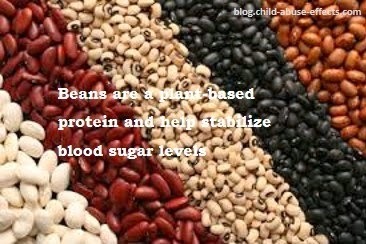 Other plant-based proteins: beans (kidney, navy, Garbanzo, black, pinto, black-eyed, etc) and split peas. 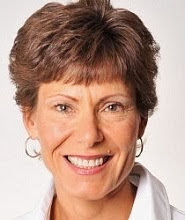 Nuts (almonds, walnuts, pecans, peanuts, etc) and seeds (chia, flax, pumpkin, sunflower, shelled hemp seeds, etc) work at reducing inflammation, which can have an effect on mood. Dark leafy greens (spinach, kale, Swiss chard, romaine, arugula, etc) are rich in a variety of vitamins, minerals and phytonutrients. Including a large variety in your diet benefits everything from skin to organs to brain function. The avocado is actually a fruit, but has gotten a bad rap over the years for its high fat content. But not all fats are created equally. 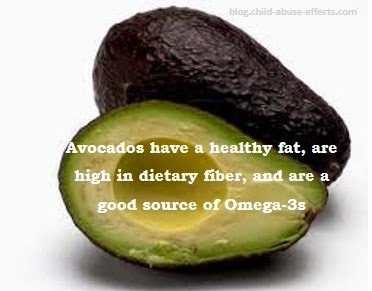 Avocados contain a very healthy form of monounsaturated fat. 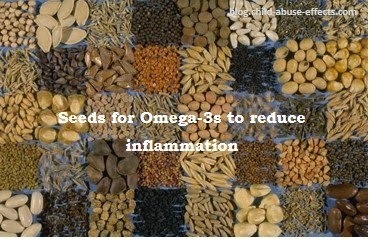 They also pack a lot of fiber and are a good source of Omega-3, which can help elevate mood. 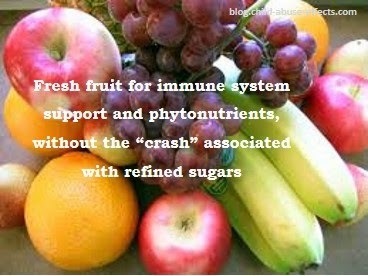 Fresh fruit has fiber and natural sugars that don't leave you with that "crash" after eating them. They are an excellent snack between meals. Most mushrooms are grown in the dark, so not all varieties have Vitamin D. But those grown in ultra-violet light do contain the vitamin. 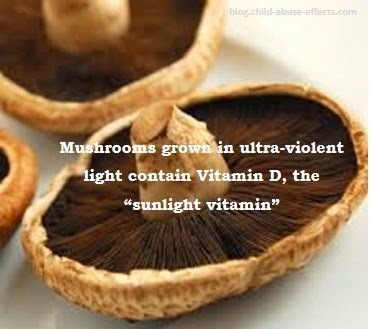 Portobello mushrooms are among those with Vitamin D, the "sunlight vitamin". Studies have shown that Vitamin D can help alleviate SAD (Seasonal Affective Disorder), a mild form of depression that affects many during the winter months. 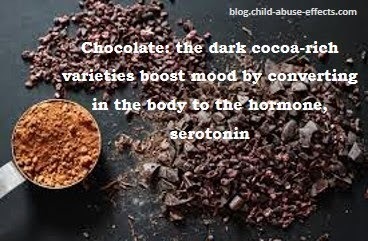 And of course, what mood-lifting list would be complete without adding chocolate to the mix. But if you think that sugary processed chocolate bar is going to give you health benefits, think again. It's the dark cocoa-rich varieties that give the nutritional benefits. Hallelujah...chocolate is one of the best mood-boosting foods out there! I get a daily dose of chocolate, along with many of the other Omega-3s and vitamin-packed foods I've listed above, in a wonderfully ice-creamy-like malted smoothie. Just look past the somewhat dark color. Blend in blender until smooth. I always blend all but the frozen fruit first, then add the fruit last to get a velvety smooth texture. If you have a Vita-mix, no need to separate the blending. This recipe yields 2 large glasses. Happy mood-busting!